For the past year (or so... who knows, really) I've been doing the rainbow hair thing. I've been purple, blue, teal, back to purple, fuchsia, red and pink. While I've enjoyed each phase, there was one colour I still hadn't conquered- green. It just so happened I was offered the chance to try Splat and green was an option. It was meant to be. I used a few different products to reach my end result, but I will say, it's pretty glorious! Read on to see my transformation and how I achieved it. Prior to my new hue, I was on the very end phase of a box red dye. It had been super vibrant, but had faded to a rosy-pink. I had been doing all of the wrong things to fade the colour- lots of hot water and sulphate filled shampoos- but there was still a fair bit of redness. Since green and red don't mesh well (why, hello murky brown!) it was the perfect opportnity to put a box of Colour Oops Hair Colour Remover to the test. 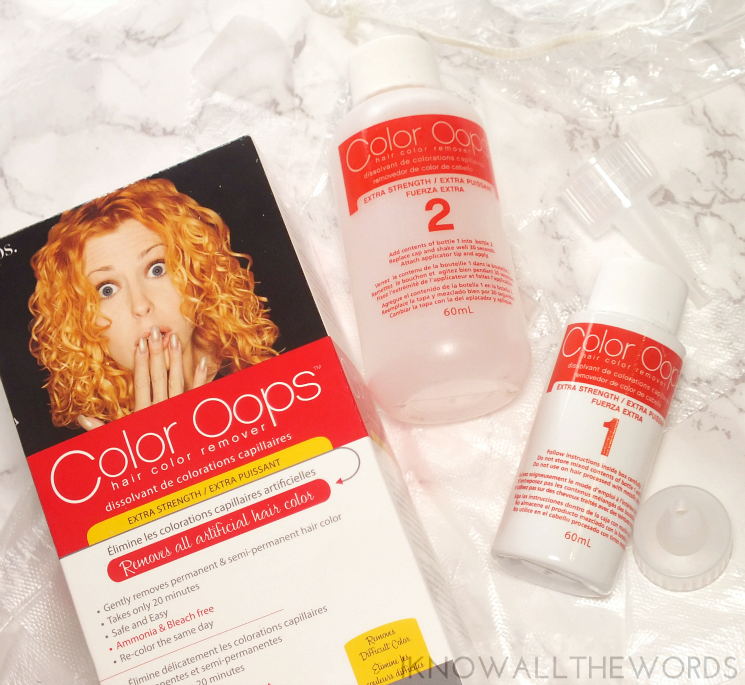 Colour Opps is an ammonia and bleach free treatment that removes dye from hair. Unfortunately, it can't remove direct/vegetable based dyes (think Manic Panic) but does work on pretty much any colour that is mixed with a developer (like a salon shade, or boxed dye.) Since I had a boxed dye over remnants of a previous Manic Panic shade, I didn't really know what colour I'd get after the Colour Oops processed. The process is as easy as can be- you mix part one and part two, apply to hair, cover it, and wait 20 minutes. It's as simple as any box dye. The process does get a bit lengthy when it comes to rinsing though, as you have to rinse your hair for 15-20 minutes to fully removes the Colour Oops and pigment from your hair. I found the Colour Oops worked really well. It removed all of the red I had in my hair and took it back to the same shade I had prior- a very unappealing bleached colour and a bit of leftover pink Manic Panic. With bulk of the red gone it was time to prep my hair for the green. I have naturally black hair, and it had been some time since my last bleaching, so I had a few inches to lighten. 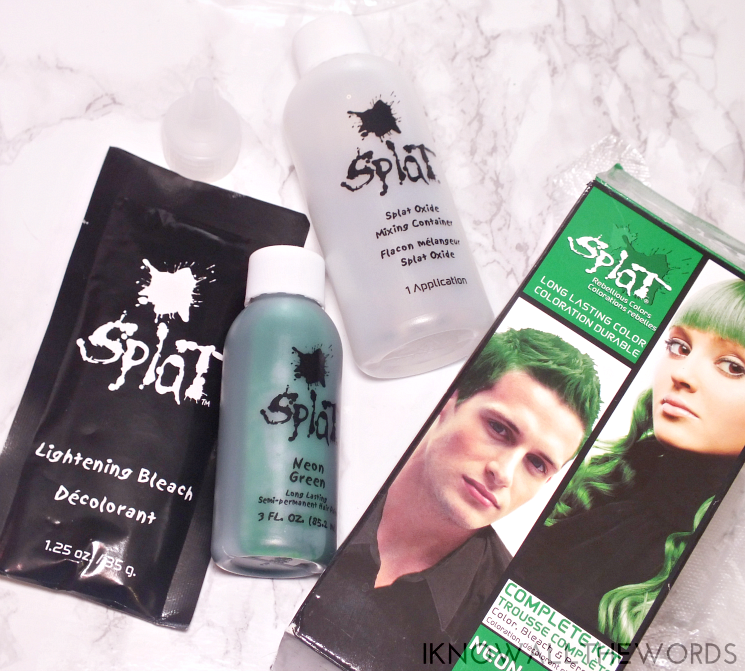 The Splat Complete Kit includes bleach and peroxide to pre-lighten hair before dying. I love that it's included, but ended up not being a fan of their bleach. The volume isn't listed on the packaging, but based on the burn, I'm guessing it's 40. I usually use Schwarzkopf Igora Royal Oil Developer and Inebrya Ice Cream Blue Bleach, which is quite gentle on hair and scalp. The Splat bleach was not only uncomfortable, but also just not enough to get the job done. If you are going to use Splat, pick up two kits. I wasn't bleaching my whole head, but still needed more. Once my hair was lightened (with my own bleach combo, mentioned above) I was ready for colour! As I still had a tiny of pink through the ends and a suspicion one bottle of Splat dye wouldn't be enough, I decided I'd add blue to the mix. Two ways actually. Splat Neon Green may be a gorgeous shade, but the neon part was a little scary. I opted to tone it down by adding a bit of Manic Panic Shocking Blue to deepen it and ensure it would blend well with the ends. 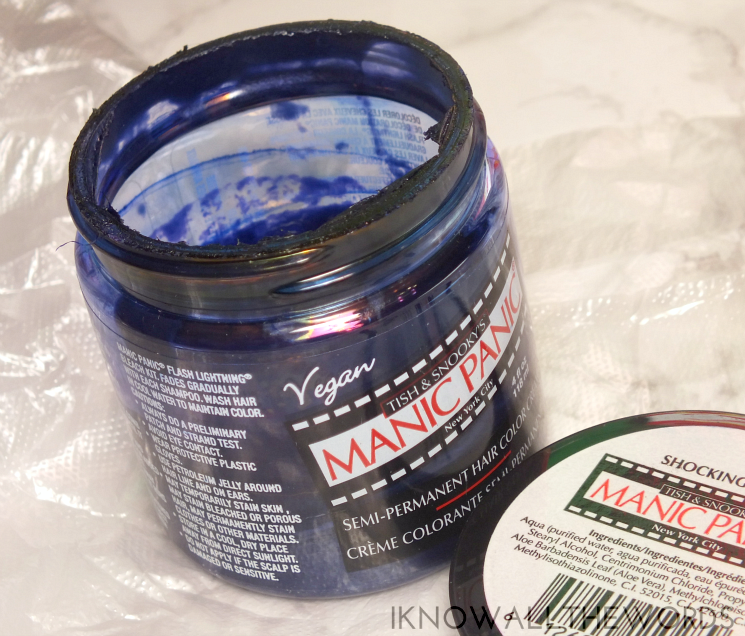 Shocking Blue is ridiculously pigmented and very deep when used straight, so I added a big scoop (or two) of conditioner to lighten it and make it go further as I only had 3/4 of a pot. It's always best to have more dye than not enough. I applied the Splat mixture on the roots and extended it down about a 1/4 of the length of my hair. My hair is pretty long right now (it needs a trim, badly) so that's about all the green dye would cover. 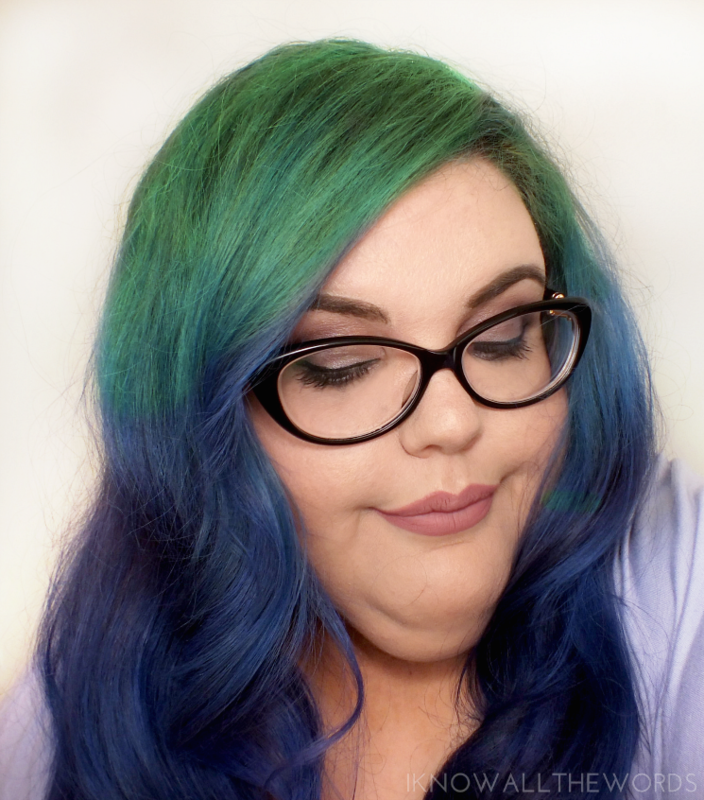 I added the Manic Panic to the ends of my hair and blended the two shades at their meeting line and hoped for a smooth ombre. Once the dye was on, I piled all my hair atop my head, covers it with a shower cap and left it to process a few hours. 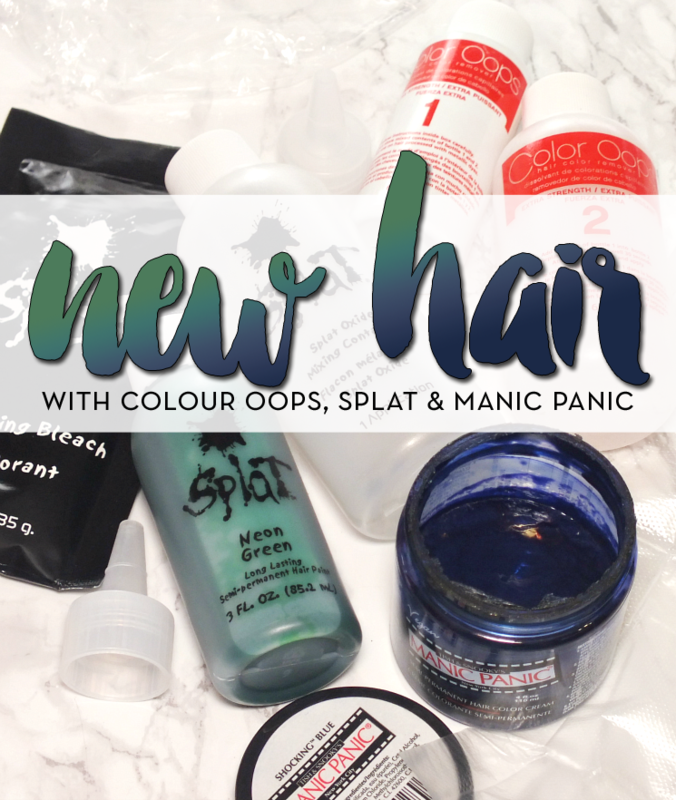 Splat and Manic Panic cab ne left on for as little as 20 minutes, but as they're direct dyes, you can leave them on longer and not damage your hair. It also results in a longer lasting, more vivid shade. Both good things. The end result, as you can see, turned out pretty great! The Splat mixture blended really with the Manic Panic and created a teal-ish blend for a smooth transition. Since the initial dying, a little bit of the pink has started to peek through the blue creating a purple-ish cast in some of the blue which is a nice addition. I could have added more conditioner to the Shocking Blue (it's really pigmented), but since it's quite deep, it's getting more vivid as it fades with each wash. Overall, I love my new colour! I'm finding the Splat shade to fade faster than I expected, but this is my first time using it, so that may just be how the formula wears. If you're going to use Splat, I highly recommend picking up two kits unless your hair is very short. Colour Oops is also a pretty incredibly product if you need to change your shade but it would be even better if it could remove novelty shades. Both Colour Oops and Splat are available online from Farley Co. and most drugstores. Are you into bight or alternative hair colours? What shade have you been wanting to try?